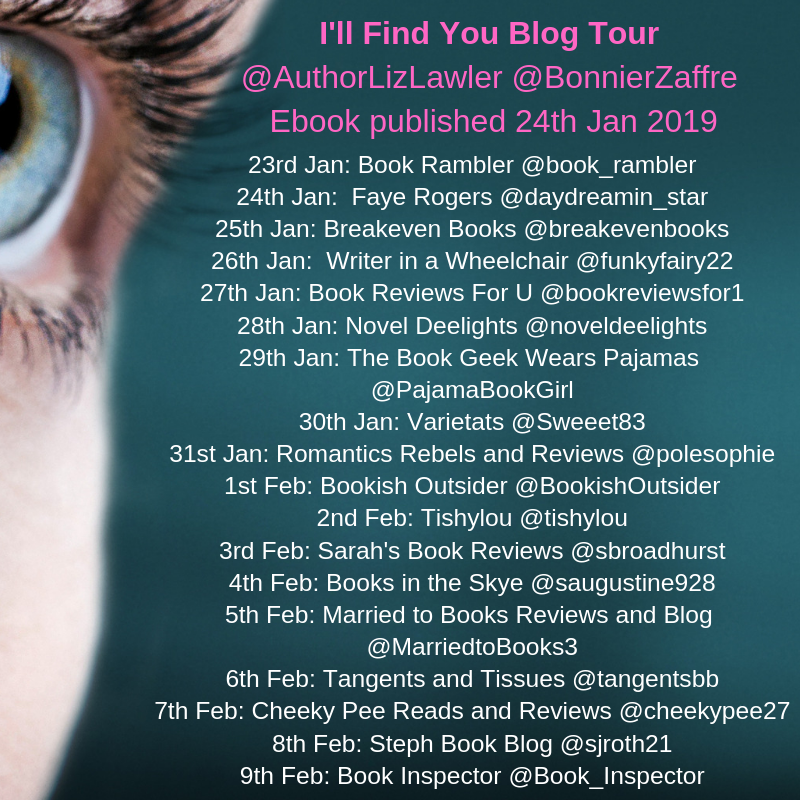 Today I’m taking part in the blog tour for I’ll Find You by Liz Lawler. I received a free copy of I’ll Find You to review. I’ll Find You is a book I nearly gave up on it before I really got started with it. There’s one scene in the first chapter that really, really freaked me out and made me not want to read it. But I decided to read chapter two as well before deciding that and it made me want to keep reading. That scene was actually the worst one in the whole book for me, the rest was suspenseful and kept me guessing but not freaked out. I would say if you want a book that is truly terrifying all the way through this isn’t for you, but if you want one that keeps you on the edge of your seat with an undercurrent of fear it could be. Emily was a really interesting main character whose story highlights both how easily other’s can manipulate opinions and that we can be completely alone while surrounded by people. I wished we saw more of her relationships with other people, particularly the police inspector, Geraldine Sutton. I also thought Emily’s backstory would have made a good novel that I’d be keen to read. The hospital setting is an interesting one. I thought some of what happened was unrealistic (but I don’t have the medical knowledge, particularly of private hospitals, to know for sure). But using somewhere we are often at our most vulnerable but are told we are safe as a setting for a psychological thriller was a brilliant idea. I liked I’ll Find You and think it could make the perfect introduction to the psychological thriller genre.